In January 1973 Garo Yepremian lined up for a field goal kick that would have put the Dolphins up 17 to nothing against the Redskins in Super Bowl VII. The kick was blocked but bounced right back into Yepremian’s hands. He saw an open receiver and tried to throw him the ball. The ball slipped out of his tiny Armenian hands and was returned for a touchdown by Mike Bass. Fortunately the Dolphins would win 14-7 but Garo spent the rest of his life hearing about that throw. Garo died on Friday at the age of 70 and that one play should not be the last thing we think of when we think of the Dolphins place kicker. I was born nearly a decade after the Dolphins 1972 undefeated season and obviously never watched Garo play, but that team is part of every Dolfans consciousness and for me Garo was my favorite player. I once bought a signed Garo jersey just so I would have a jersey of his to wear. And why did I love this player I had never seen play so much? Well to begin with he was a good football player. He was instrumental in introducing soccer style kickers into the NFL and won many a game for the Dolphins. Although I couldn’t find the story anywhere online, I heard that Garo used to kick the ball into the stands so often that the notoriously cheap Joe Robbie put up the now standard nets behind the goal posts so that he wouldn’t have to buy new balls every week. Aside from being a great football player he was someone any American should look up to. His story of coming to America from Cypress to try to get an education has been told in every obituary of the kicker. He spoke four languages and made ends meet selling his own brand of ties during the off season. He spent his life after football as a motivational speaker and started the Garo Yepremian Foundation to raise money for brain cancer research after his daughter in low was lost to the disease… the same disease that later took his life. But the reason I loved Garo was because he was hilarious. From his famous “I keek a touchdown!” to his diminutive stature and bald head to the throw that made him the laughing stock of the NFL, Garo always had a sense of humor. He starred in a fantastic Right Guard commercial back in the 70’s and once again made fun of his throw in the Reebok “Perfectville” commercials back in 2008. He threw Obama a pass at the white house and he made Dolfans laugh at every signing and public appearance. The guy was just happy to be alive and it kills me that he’s gone. As an adult I have stepped back from hoarding the Dolphins memorabilia that I collected as a kid but one of the things I still collect is Miami Dolphins vinyl records. I was a big music collector and the cross over between music and Dolphins was too hard to pass up. It started out with a 45RPM copy of the Dolphins fight song and continued with dozens of records including a copy of the record that Garo recorded in 1973. In honor of Garo Yepremian I wanted to share with you the two songs Garo recorded with the help of a man named Ted Lampidis. The A side to the record is called Yepremian’s Lament and it tells the story of that fateful throw and how sad he was after he threw that pass. It’s kind of amazing and features an unnecessary amount of castanets. The B side is a love story in both English and what I assume is Armenian (maybe Greek?). It’s pretty adorable. Lastly, and most importantly Dolfans NYC made a $500 donation to the Garo Yepremian Foundation. One of my friends died of brain cancer at 25 and it’s extra horrifying because not only is it killing you but it can do terrible and unpredictable things to you along the way. My friend woke up one day and couldn’t feel one half of his body it was awful. The disease took the lives of both Garo and his daughter in law and in his memory not only are we donating the $500 but we are asking you to donate as well. We will match any donation you guys make up to another $500. It would be really amazing as a group if we could raise $1500. So if you make a donation (tax deductible!) send us an email (dolfansNYC@gmail.com), or let us know over on our Facebook page and we will match your donation. Thanks for reading this, and let’s try and remember Garo for all the amazing things and not the one bad play. 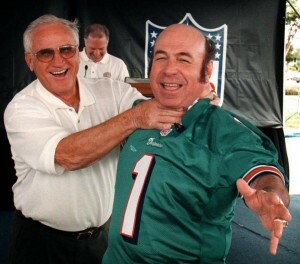 We will miss you Garo, the original Miami Dolphins #1! This entry was posted on Sunday, May 17th, 2015 at 12:30 pm	and is filed under Music. You can follow any responses to this entry through the RSS 2.0 feed. Both comments and pings are currently closed.